We spent a few very-relaxing and enjoyable days at Paradise Lakes Resort in Pasco County, just north of Tampa, Florida. Whether you are younger, older, straighter, gayer, thinner or thicker, lighter or darker, Paradise Lakes Resort staff and guests will welcome you like part of the family. Smiling faces (and bare bottoms) are everywhere! 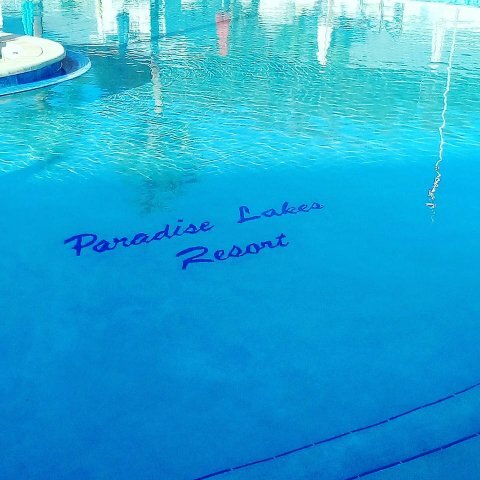 Paradise Lakes Resort is a private, clothing optional hotel and resort where everyone is "welcome to be yourself in a tropical, fun filled setting." Their policy is “take off as much as you are comfortable with to make the initial visits stress free." The Paradise Lakes Resort's 72 acres holds 60+ hotel rooms (most of them situated poolside), an upscale restaurant, a nightclub, a poolside Key West Bar, a fitness center with a gym. a day spa, tennis, sand volleyball, water volleyball, hot tubs, a HUGE heated conversation pool and an all-season pool. We asked social media representative Ellie Meadows to tell us more. How would you describe Paradise Lakes Resort in one sentence? A comfortable and relaxing resort experience, where you can hang out and make new friends, while being able to wear as much or as little as you would like. What is special about Paradise Lakes Resort and your guests? Everyone is very welcoming and friendly. We have members/guest from all over the United States and other countries. We have a wide range of ages that all share the common interest of a clothing free life! What accommodations are available at Paradise Lakes Resort? We have 42 cabanas with 4 different room options. Each cabana is located poolside which gives the guest a beautiful view of our resort. What activities and special events are available and upcoming at Paradise Lakes Resort? We have a lot of events that take place throughout the year. We have strip n dip during our summer months - meaning on Sundays, anyone gets in complementary with a purchase of a cash card. In June, we are having our second annual Paradise Pride Pool Party. In July, we will have our first annual National Nudist Day Thanks for Being Naked, big celebration! We have quarterly open houses so that everyone can see what Paradise Lakes Resort has to offer. Halloween is a big deal for us. We have 5 nights of dressing up and activities! We always end our year with a big New Years Eve party. Why is nudism/naturalism an important and healthy choice? As a nudist, we are all equal. It takes stress away when you aren't worried about what you need to wear. Nudism can also be a healthy choice because of all the activities we offer both day and night. We have all types of sports which keeps you feeling young and healthy. We have daily pickleball and water volleyball tournaments. We also have tennis, sand volleyball, shuffleboard and petanque. Paradise Lakes Resort is definitely a top-notch nudist resort. If you’re tastes lean more toward luxury and comfort rather than camping, this is the nudist resort to try. The minute we stepped through the doors, we felt like we were in an upscale resort with immaculate hotel lodgings, pools, hot tubs, bars and more. Not only did the staff greet everyone with a smile, all the guests did too. The 60+ person conversation tub is a fantastic asset where people of everyone variety imaginable sit, chat and make new friends. We highly recommend Paradise Lakes Resort for nudists, naturists, skinnydippers and anyone who wants to give it a try. Photos courtesy of Paradise Lakes Resort.